In 50 to 75 years, SimCity, the virtual city-building game just about every architect or planner has played around with at some point, imagines an average metropolis taking two routes—a sustainability-based, green utopia or a money-driven, oil-dependent corruption—and gives players the tools to construct these futures. Slated for release in the United States on November 13th, Cities of Tomorrow, the new SimCity expansion pack, allows players to engage in futuristic urban planning using imagined versions of current technology. Elevated Maglev trains transport passengers high above congested vehicle traffic; drones deliver packages and prevent neighborhood crime; high-rise “MegaTowers” become mixed-use complexes with customizable retail, residential, education, and solar energy plant levels. 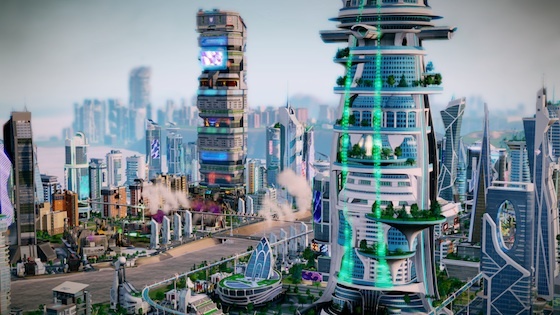 However, PSFK reports that unlike previous editions of the game, the Cities of Tomorrow expansion requires its virtual city planners to consider the tradeoffs of their architecture and urban construction efforts. Source and type of energy for power will determine the government and pollution level of each town and consumerism and lure of cheap labor can overcome clean, sustainable methods for maintenance of each urban environment.